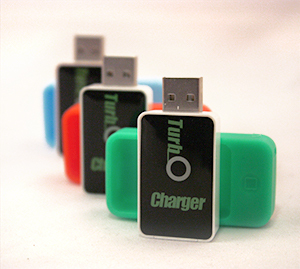 Power Banks for charging electronic devices come in many shapes and sizes. I recently was made aware of a real tiny one which I believe is the smallest one I have ever seen from USB Depot called REUM High-Speed USB Charge Adapter this one comes in an orange rubber case that has a clasp that could fit on any key ring, backpack zipper or anywhere you want to attach it. This is a fast speed for your PC, automobile USB port, AC charger for home usage, Smartphone, tablets and more. REUM charges Galaxy S3 in 2:56, Galaxy Note 2 in 3:10, iPhone 4S/5 in 2:10 and lastly iPad2 in 3:50 those seem like pretty fast charging times. The way you use it is on the side there are the letters A stands for Apple products and white LED light, D stands for Sending data 480Mbps data communication with the computer and LED extinguisher and S stand for Android Phones and a blue lED light. My Opinion: So I attached the USB cord to my computer and then to the phone which went very snug into I have an Android phone so the blue light came on when I looked at the phone it had the sign for charging so that is a plus. I think this would be great for traveling as you can charge your phone right through your laptop instead of carrying so many different cords and plugs.